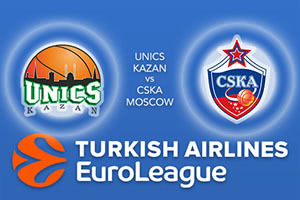 This may be an all-Russian clash in the Euroleague but that is where the similarities end between these sides. The hosts have a 7-20 record and have long been eliminated from playoff contention. The away side are not only the reigning Euroleague champions, they have just secured home-court advantage in the playoffs so CSKA Moscow have a lot to look forward to. With that home court advantage in the bag, the CSKA side may take their eye off the prize in this game but there is still top spot in the Euroleague up for grabs, and this should provide the Moscow team with an incentive for this match. The two teams know each other very well from domestic clashes but this will be only the second time they have met in the Euroleague. The previous game, which took place in Round 4 of this season, ended in a 98-80 victory for CSKA Moscow. Milos Teodosic was on top form that evening, helping himself to a double-double of 16 points and 10 assists. The Moscow team has the best offensive record in the tournament, offering an average of 87.6 points per game while the side from Kazan has the third poorest record in the table, offering an average of 76.6 points per game. The hosts are enduring a terrible run of form at the moment, losing 10 games in a row. This is the poorest streak the hosts have endured. For CSKA, the formbook looks like five wins out of six, so they are ticking over quite nicely but they will be looking towards the next stage of the Euroleague season before they get too excited. Keith Langford remains the top scorer in the Euroleague so far this season, offering an average of 22.5 points per game for Unics Kazan while Nando De Colo is the second best scorer, and he has provided an average of 20.2 points per game so far this campaign. Quino Colom has provided an average of 11.6 points per game for the hosts and Teodosic has notched an average of 16 points per game while also leading the way with an average of 6.3 assists per game. The away side should have enough to power through and claim a major victory so back CSKA Moscow at -9 at odds of 1.90. If you’re looking at the Over/Under market, go OVER 166.5 at odds of 1.90. Bet Now!